Hazel McCallion the Mayor of Mississauga, I saw her the first time when she gave the graduation address to the students when our daughter Nidhi graduated from high school in 2009. She came driving her Chevrolet Malibu car bearing the licence plate ‘MAYOR1’. The graduation address was inspiring, motivating and would make any listener think. She peppered her address with wit and humour and made everyone laugh too. Immediately after delivering the address, she dashed off to the next high school in the city to address that school’s graduates. This proved that her nickname of ‘Hurricane’ Hazel suited her to the tee. Hazel McCallion, has won every mayoral election contested in Mississauga since 1978. She is the longest serving mayor in Canada and has kept the city debt-free since her first term of office. McCallion began her political career in 1968 on the Streetsville municipality which she served as Chairman of the Planning Board, Deputy Reeve, Reeve and then Mayor of Streetsville. In 1974, Streesville got incorporated into the City of Mississauga. In her first mayoral election in 1978 she narrowly defeated the incumbent mayor. In 1979 she came into world news when a public health and safety crisis occurred during the 1979 Mississauga train derailment. A train carrying toxic chemicals derailed in a heavily populated area of Mississauga. A large explosion and fire ensued as hazardous chemicals spilled. McCallion, along with the Police and other governmental authorities, oversaw an orderly and peaceful evacuation of the entire city of 200,000 residents. Despite having sprained her ankle, she continued to hold press conferences and update briefings. There were no deaths or serious injuries during the week-long emergency. Her reputation has hinged on her financial acumen and political pragmatism, with her no-nonsense style endearing her to constituents and alienating some opponents. In 1991 she became the first mayor to submit their city’s budget to public scrutiny. Mayor McCallion is well known for her love of hockey. She played for a professional women’s team while attending school in Montreal. One of her friends and a hockey commentator Don Cherry, who joked during her 87th birthday that while 98 per cent of the city voted for her, he was looking for the remaining 2 per cent that didn’t. She never campaigned for the elections, she never put up posters, she never delivered any elections speeches, but she always got over 90% of the votes. Mayor McCallion was born in Port Daniel of Quebec on February 14, 1921 and educated in Quebec City and Montreal. She then began her career in Montreal with Canadian Kellogg, an engineering and contracting firm, and was transferred to Toronto in 1942 to help set up the local office. Mayor McCallion remained with the company for 19 years. In 1967 she decided to leave the corporate world and devote her career to politics. Hazel was married to Sam McCallion on September 29, 1951. Sam passed away in 1997. Hazel’s in-laws on her marriage to Sam gifted a piece of land in the village of Streetsville. She still resides in Streetsville and believes that one got to have a life filled with purpose and meaning and living her life in a Christian-like manner helped to motivate her and keep her energized. She does everything around the house herself like cleaning, grocery shopping, gardening, etc. She likes to be self sufficient and thinks that housework and gardening are great forms of exercise and keep her humble. Her principles are grounded in the belief that a city should be run like a business; thus, she encourages the business model of governance. Her family’s business background, her education, and her prior career in a corporation prepared her to approach government with this model. Hazel’s Hope, a campaign to fund health care for children afflicted with AIDS and HIV in southern Africa is her charity initiative. Hazel became the poster girl for longevity and good health for Trillium Health Centre. On her 90th birthday, Dr. Barbara Clive, a geriatrician, marvelled at Hazel’s good health: “At 90 her gait is perfect, her speech is totally sharp and she has the drive to still run this city. She’s the poster child for seniors”. In December 2014, Mayor McCallion will step-down and people of the city are feeling ‘bad’ about it. What an amazing woman, who has given her life to our great city. She is never going to be replaced, she is Mississauga. What an inspiration for all women and for those of a certain age, that they aren’t done yet and can still live happy very productive active lives. To the generations coming up behind, to work hard and make a name for oneself and make a difference. 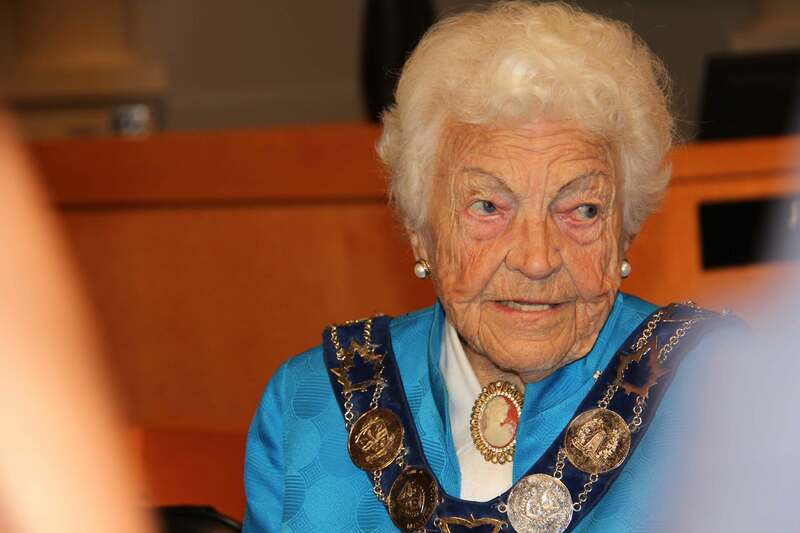 After delivering her annual State of the City speech, her last as mayor, on September 23, 2014 Mayor McCallion had some advice for anyone who wanted to fill her coveted seat in Mississauga: “Don’t make promises you can’t keep. You have got to be honest with people. You can’t make promises when you haven’t got a hope to fulfil them”. Hazel McCallion was appointed as special adviser to the principal of the University of Toronto Mississauga. She is engaged in her passion project is to develop a course to will teach people how to participate in public office. Hazel McCallion has been such an amazing Mayor to the wonderful city of Mississauga, and no one will ever be able to live up to her amazing work throughout the years. The people of Mississauga are grateful to have had such a strong and caring women take care of our beautiful city. Now she has left some big shoes to fill and in all honesty, there will simply never be another Mayor that can make the people of Mississauga feel the way the people feel for Hazel. Every now and then a person comes around and truly leaves a legacy, you Hazel have done more for the city than most world leaders have done in their lifetime.